Background: Primary percutaneous coronary intervention (PCI) has been shown to be an effective therapy for patients with acute myocardial infarction (MI). Glycoprotein (GP) IIb/IIIa receptor blockers reduce thrombotic complications in patients undergoing PCI. Most available data relate to Reopro, which has been registered for this indication. GP IIb/IIIa reduce unfavorable outcome in U/A and non ST-elevation myocardial infarction (STEMI) patients. Only few studies focused on high dose Aggrastat for STEMI patients in the emergency department (ED) before PCI. The aim is to increase the patency during the time awaiting coronary angioplasty in patients with acute MI. Objectives: To study the effect of upfront high bolus dose (HDR) of tirofiban on the extent of residual ST segment deviation 1 hour after primary PCI and the incidence of TIMI 3 flow of the infarct-related artery (IRA). Materials and Methods: A randomized, open label, single center study in the ED. A total of 90 patients with acute ST-elevation MI, diagnosed clinically by ECG criteria (ST segment elevation of >2 mm in two adjacent ECG leads), and with an expectation that a patient will undergo primary PCI. Patients were aged 21-85 years and all received heparin 5000 u, aspirin 160 mg, and Plavix 600 mg. Patients were divided in two groups (group I: triofiban high bolus vs group II: Reopro) with 45 patients in each group. In group I, high bolus triofiban 25 mcg/kg over 3 min was started in the ED with maintenance infusion of 0.15 mcg/ kg/min continued for 12 hours and transferred to cath lab for PCI. Patients in group II were transferred to cath lab, where a standard dose of Reopro was given with a bolus of 0.25 mcg/kg and maintenance infusion of 0.125 mcg/kg/min over 12 hours. Results: ST segment resolution and TIMI flow were evaluated in both groups before and after PCI. Thirty-five patients (78%) enrolled in group I and 29 patients (64%) in group II had resolution of ST segment (P-value 0.24). Twenty-one patients (47% group I) vs 23 patients (51% group II) with P-value 0.83 achieved TIMI 0 flow. Twenty-four patients (53% group I) compared with 22 patients (49% group II) with P-value 0.83 had TIMI 1 to 3 flow before PCI. TIMI 3 flow was achieved in 40 patients (89% group I) compared with 38 patients (84% group II) with P-value 0.76. Conclusion: In this study there was a trend toward better ST segment resolution and patency of IRA (i.e., improved TIMI flow) in patients given high bolus dose Aggrastat in the ED. Larger studies are needed to confirm this finding. Few studies have focused on facilitated PCI, that is, the use of pharmacologic pretreatment before PCI. Facilitated PCI aims to increase patency during the time awaiting coronary angioplasty in patients with acute MI. A randomized, open label, single center study was conducted in the emergency department (ED). A total of 90 patients with acute ST-elevation MI, diagnosed clinically by ECG criteria (ST-segment elevation of >2 mm in two adjacent ECG leads), and with expectation that the patient will undergo primary PCI. Patients were aged 21-85 years and all received heparin 5000 u, aspirin 160 mg, and Plavix 600 mg. Patients were divided in two groups (group I: tirofiban high bolus vs group II: Reopro) with 45 patients in each group. In group I, high bolus tirofiban 25 mcg/kg over 3 min was started in ED with maintenance infusion of 0.15 mcg/kg/min continued for 12 hours and transfer to cath lab for PCI. Patients in group II were transferred to cath lab, where a standard dose of Reopro was given with a bolus of 0.25 mcg/kg and maintenance infusion of 0.125 mcg/kg/min over 12 hours. Study protocol is shown in [Figure 1]. Demographic and clinical characteristics were recorded on admission [Table 1]. For all patients, clinical data were collected 30 days after the acute event and/or until the moment of death. The coronary angiographies were evaluated by two cardiologists blinded to group or clinical information. The patency of the infarct-related artery (IRA) was evaluated according to the TIMI classification. TIMI flow grade 3 is defined as rapid and complete filling of the IRA, compared with the coronary arteries which are not involved in the MI; TIMI flow grade 2 is defined as complete but slower filling of the IRA, compared with the coronary arteries not involved in the MI. Before primary angioplasty, TIMI flow grades 2 and 3 were considered a (partially) patent IRA. After primary angioplasty, successful reperfusion of the IRA was defined as TIMI flow grade 3 in combination with a residual stenosis of less than 50%. Differences between group means were assessed with the two-tailed Student's t-test. Chi-square analysis or Fisher's exact test were used to evaluate differences between proportions. Statistical significance was defined by a P-value of less than 0.05. Patients were seen in the outpatient clinic at 30 days and contacted by telephone at 1 year after the PCI and as frequently as considered necessary by the investigator. Recurrent MI within 30 days after completion of PCI is defined as a new increase in Troponin I and CK-MB (>3 times the upper limit of normal), whether or not accompanied by chest pain and/or ECG changes. Elevation of cardiac enzymes needed to be present in two separate blood samples. Urgent target vessel revascularization (TVR) is defined as re-PCI of the IRA within 30 days after the index PCI. To investigate the effect of pretreatment with high bolus (25 μg/kg) and maintenance infusion tirofiban on the amount of residual cumulative ST deviation 1 hour after primary PCI for acute STEMI, compared with Reopro bolus in cath lab during PCI and maintenance with similar pretreatment (aspirin, heparin, and 600 mg of clopidogrel). ECGs done 1 hour after PCI. Patients with right bundle branch block who clearly have ST segment-elevations are included in the analysis. All ECGs were analyzed by an independent cardiologist. The sum of ST segment deviation was measured 20 microseconds after the end of the QRS complex with a caliper. The sum of residual ST-segment deviation is classified into four groups. - 0 mm: normalized ST segment, defined as no residual ST segment deviation; 1-3 mm: defined as residual ST segment deviation between 1 and 3 mm; 4-6 mm: defined as residual ST segment deviation between 4 and 6 mm; and >7 mm: defined as a residual ST segment deviation more than 7 mm. The patency of the IRA was evaluated according to the TIMI classification. ST-segment resolution (STR) after PCI and TIMI flow before and after PCI was evaluated in both groups before and 1 hour after PCI. 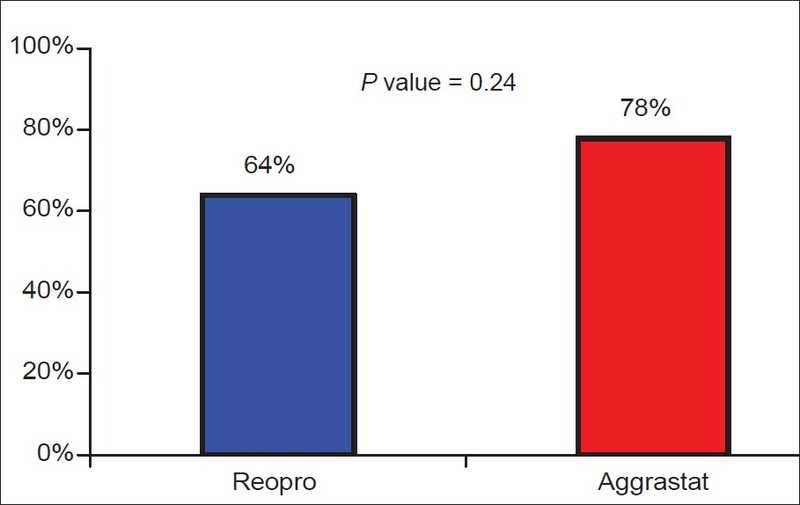 STR after PCI was seen in 64% of Reopro group and 78% of Aggrastat group with P-value of 0.24 [Figure 2]. 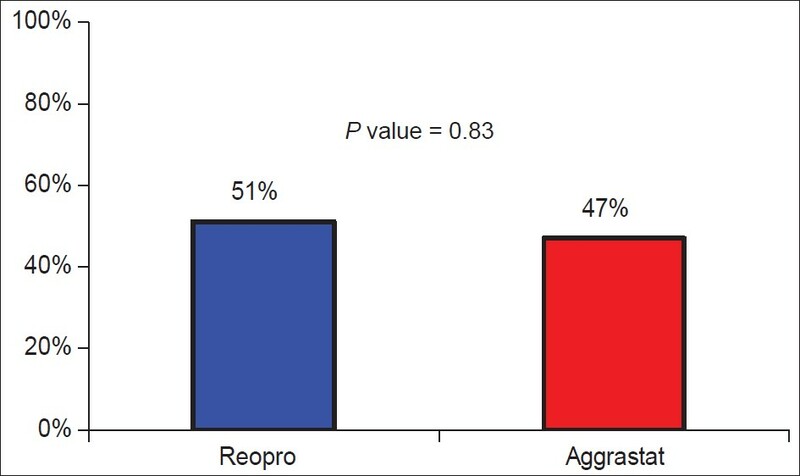 TIMI 0 flow before PCI was 51% in Reopro group and 47% in Aggrastat group with P-value 0.83 [Figure 3]. 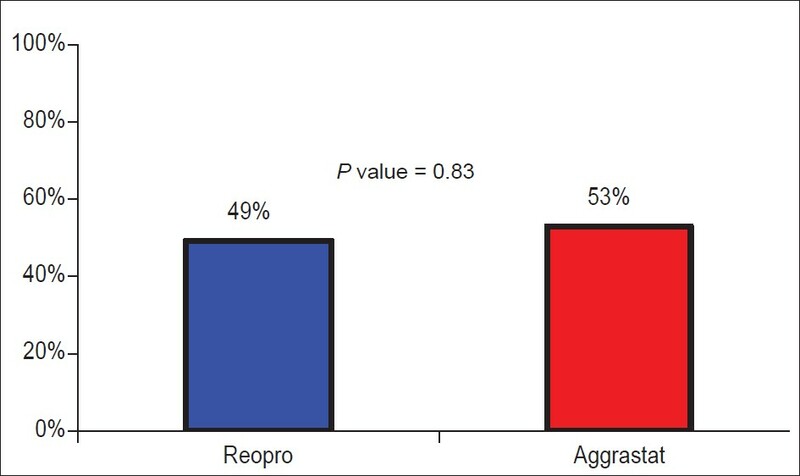 TIMI 1-3 before PCI was 49% in Reopro group and 53% in Aggrastat group with P-value 0.83 [Figure 4]. 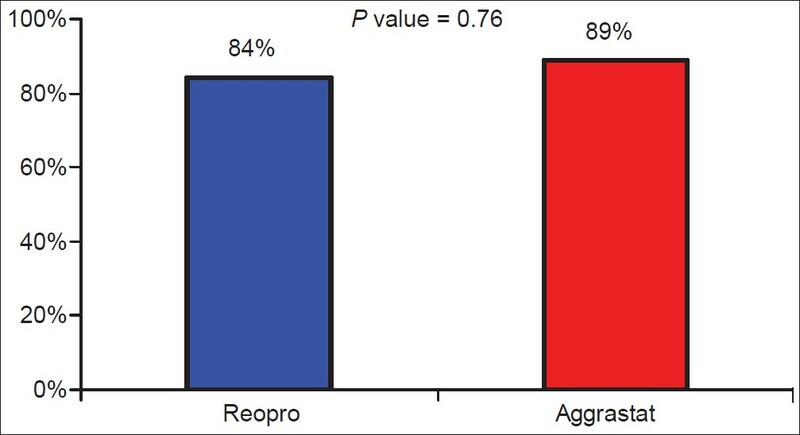 TIMI 3 flow after PCI was 84% in Reopro group and 89% in Aggrastat with P-value 0.76 [Figure 5]. Repeated revascularization was done during 1 year in three patients in Reopro group and in two patients in Aggrastat group. Death occurred in two patients in Reopro group (one patient due to cardiac and one noncardiac cause during hospitalization) and one patient in the Aggrastat group due to cardiac cause (VSD). In the single-center, open label, randomized STOP-AMI trial, the combination of stenting plus abciximab was shown to enhance myocardial salvage and markedly improve event-free survival at 30 days and 1 year compared with accelerated t-PA. Similarly, among 162 AMI patients randomized to primary PCI with abciximab or a pharmacologic strategy of reduced-dose alteplase with full-dose abciximab, coronary stenting plus abciximab resulted in significantly greater myocardial salvage and infarct size measured by nuclear imaging at 11 days postinfarction. Although 6-month survival tended to favor patients randomized to the invasive strategy, overall survival did not significantly differ in this modest-sized study. Neumann et al. also explored the effects of abciximab on myocardial recovery and coronary flow following stenting in AMI patients. In that study, 200 patients within 48 hours of onset of AMI in whom a primary or rescue stent strategy was planned were randomized to a bolus plus 12-hour infusion abciximab regimen or control. Patients treated with abciximab had a lower composite rate of in-hospital death, reinfarction, or urgent TVR (9.2% vs 2.0%; P < 0.05). The ideal combination of fibrinolytic, antithrombin, and GP IIb/IIIa inhibitor is also uncertain. Clinical results from forthcoming trials should therefore further clarify the safety and efficacy of combined therapy in addition to its potential as a cost-effective measure. Integration of most effective pharmacology with percutaneous revascularization strategies also remains an unresolved issue. The improvements in ventricular function, early recurrent ischemia, and both early and intermediate survival with GP IIb/IIIa inhibition in primary PCI support the use of these agents as adjunctive therapy to mechanical revascularization, particularly with timely administration before arrival in the catheterization laboratory. Whether the early performance of angiography and catheter-based intervention following combination therapy for ST- elevation MI will yield favorable outcomes similar to the experience in non-ST-elevation ACS (TIMI 18-TACTICS) is less definitive. However, considering the importance of prompt restoration of flow in the IRA, the collective experience with fibrinolysis and primary PCI has fostered the concept of "facilitated PCI", and randomized trials evaluating the safety and efficacy of this strategy are underway. Analysis from the On-TIME 2 trial evaluated the efficacy of triple antiplatelet therapy on initial patency and STR in relation to time from symptom onset to first medical contact. Patients were randomized to dual (500 mg aspirin and 600 mg clopidogrel) or triple antiplatelet (500 mg aspirin, 600 mg clopidogrel, and tirofiban 25 μg/kg bolus and 0.15 μg/kg/min maintenance infusion for 18 hours) pretreatment in the ambulance. In our small trial of 90 patients, there was a trend for better STR and more patency of IRA and improved TIMI flow in patients who were given high bolus dose of Aggrrastat, which was started early in the ED in comparison with patient who were given abciximab standard dose in the cath lab during their PCI. Regardless of the treatment strategy, effective platelet inhibition appears to be a critical element in rising above the "ceiling of reperfusion" and past the limitations of current therapies. 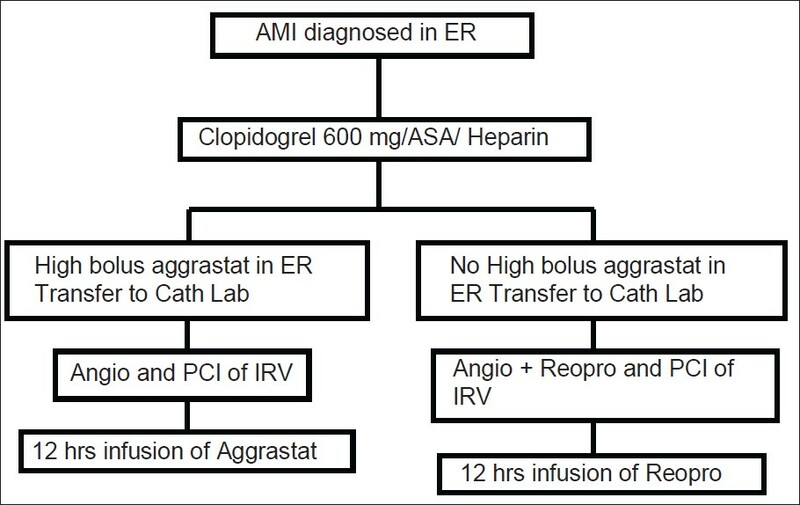 While the available data should facilitate the use of adjunctive GP IIb/IIIa inhibitors as part of initial antithrombotic therapy for primary PCI, results from future trials should further refine the role of these agents as part of treatment algorithm for the initial pharmacologic management of patients with acute MI. Most current trials with GP IIb/IIIa inhibitor in ST elevation MI have been conducted with abciximab. There is some data with high dose bolus (HDR) tirofiban plus high-dose clopidogrel in STEMI. This study demonstrates a minor trend toward better STR and TIMI flow in IRA in the aggrastat group. These findings are consistent with On-TIME 2 study result. Larger studies are needed to clarify if this strategy and dose regimen have a clinical impact. The patient number is small; the research center has limited the number for a period of only 1 year. Immediately tirofiban was started in the ED, whereas the abciximab was started during the PCI in catheterization laboratory. To the ED including the ED doctors and nurses who helped us to recruit those patients who fit the criteria of the study. Also, very special thanks to catheterization laboratory staff including the consultants, residents, nurses, and technicians at KACC. 1. Zijlstra F, de Boer MJ, Hoorntje JC, Reiffers S, Reiber JH, Suryapranata H. A comparison of immediate coronary angioplasty with intravenous streptokinase in acute myocardial infarction. N Engl J Med 1993;328:680-4. 2. Zijlstra F, Hoorntje JC, de Boer MJ, Reiffers S, Miedema K, Ottervanger JP, et al. Long term benefit of primary angioplasty as compared with thrombolytic therapy for acute myocardial infarction. N Engl J Med 1999;341:1413-9. 3. Zijlstra F, van 't Hof AW, Liem AL, Hoorntje JC, Suryapranata H, de Boer MJ. Transferring patients for primary angioplasty: A retrospective analysis of 104 selected high risk patients with acute myocardial infarction. Heart 1997;78:333-6. 4. Liem AL, van 't Hof AW, Hoorntje JC, de Boer MJ, Suryapranata H, Zijlstra F. Influence of treatment delay on infarct size and clinical outcome in patients with acute myocardial infarction treated with primary angioplasty. J Am Coll Cardiol 1998;32:629-33. 5. The CAPTURE Investigators. Randomized placebo-controlled trial of abciximab before and during coronary intervention in refractory unstable angina: The CAPTURE study. Lancet 1997;349:1429-35. 6. The EPIC Investigators. Use of a monoclonal antibody directed against the platelet glycoprotein IIb/IIIa receptor in high-risk coronary angioplasty. N Engl J Med 1994;330:956-61. 7. The EPILOG Investigators. Platelet glycoprotein IIb/IIIa receptor blockade and low-dose heparin during percutaneous coronary revascularization. N Engl J Med 1997;336:1689-96. 8. The EPISTENT Investigators. Randomised, placebo-controlled and balloon angioplasty controlled trial to assess safety of coronary stenting with use of platelet glycoprotein IIb/IIIa blockade. Lancet 1998;352:87-92. 9. The PURSUIT Trial Investigators. Inhibition of platelet glucoprotein IIb/IIIa with eptifibatide in patients with acute coronary syndromes. N Engl J Med 1998;339:436-43. 10. The PRISM Study Investigators. A comparison of aspirin plus tirofiban with aspirin plus heparin for unstable angina. N Engl J Med 1998;338:1498-505. 11. The PRISM-PLUS Study Investigators. Inhibition of the platelet glycoprotein IIb/IIIa receptor with tirofiban in unstable angina and non-Q wave myocardial infarction. N Engl J Med 1998;338:1488-97. 12. The RESTORE Investigators. Effects of glycoprotein IIb/IIIa blockade with tirofiban on advese cardiac events in patients with unstable angina or acute myocardial infarction undergoing coronary angioplasty. Circulation 1997;96:1445-53. 13. Valgimigli M, Campo G, Percoco G, Bolognese L, Vassanelli C, Colangelo S, et al. Multicentre evaluation of single high-dose bolus tirofiban vs abciximab with sirolimus-eluting stent or bare metal stent in acute myocardial infarction study (MULTISTRATEGY) investigators. JAMA 2008;299:991788-99. 14. Van't Hof AW, Ten Berg J, Heestermans T, Dill T, Funck RC, van Werkum W, et al. Ongoing Tirofiban in myocardial infarction evaluation (On-TIME) 2 study group, Lancet 2008;372:537-46. 15. De Luca G, Maas AC, Suryapranata H, Ottervanger JP, Hoorntje JC, Gosselink AT, Dambrink JH, et al. Prognostic significance of residual cumulative ST segment deviation after mechanical reperfusion in patients with ST segment elevation myocardial infarction. Am Heart J 2005;150:1248-54. 16. Roe MT, Ohman EM, Maas AC, Christenson RH, Mahaffey KW, Granger CB, et al. Shifting the open-artery hypothesis downstream: The quest for optimal reperfusion. J Am Coll Cardiol 2001;37:9-18. 17. van't Hof A, Liem A, de Boer M, Zijlstra F. Clinical value of 12-lead electrocardiogram after successful reperfusion therapy for acute myocardial infarction. Lancet 1997;350:615-9. 18. Claeys MJ, Bosmans J, Veenstra L, Jorens P, De RaedtH, Vrints CJ. Determinants and prognostic implications of persistent ST-segment elevation after primary angioplasty for acute myocardial infarction: Importance of microvascular reperfusion injury on clinical outcomes. J Am Coll Cardiol 1999;99:1972-7. 19. Gibson CM, de Lemos JA, Murphy SA, Marble SJ, McCabe CH, Cannon CP, et al., for the TIMI Study Group. Combination therapy with abciximab reduces angiographically evident thrombus in acute myocardial infarction: A TIMI 14 substudy. Circulation 2001;103:2550-4. 20. de Lemos JA, Antman EM, Gibson CM, McCabe CH, Giugliano RP, Murphy SA, et al., for the TIMI 14 Investigators. Abciximab improves both epicardial flow and myocardial reperfusion in ST-elevation myocardial infarction: Observations from the TIMI 14 Trial. Circulation 2000;101:239-43. 21. Schömig A, Kastrati A, Dirschinger J, Mehilli J, Schricke U, Pache J, et al. Coronary stenting plus platelet glycoprotein IIb/IIIa blockade compared with tissue plasminogen activator in acute myocardial infarction. Stent versus Thrombolysis for Occluded Coronary Arteries in Patients with Acute Myocardial Infarction Study Investigators. N Engl J Med 2000;343:385-91. 22. Kastrati A, Mehilli J, Dirschinger J, Schricke U, Neverve J, Pache J, et al. Myocardial salvage after coronary stenting plus abciximab versus fibrinolysis plus abciximab in patients with acute myocardial infarction: A randomised trial. Lancet 2002;359:920-5. 23. Neumann FJ, Blasini R, Schmitt C, Alt E, Dirschinger J, Gawaz M, Kastrati A, et al. Effect of glycoprotein IIb/IIIa receptor blockade on recovery of coronary flow and left ventricular function after the placement of coronary-artery stents in acute myocardial infarction. Circulation 1998;98:2695-701. 24. The ERASER Investigators. Acute platelet inhibition with abciximab does not reduce in-stent restenosis. Circulation 1999;100:799-806. 25. Schweiger MJ, Cannon CP, Murphy SA, Gibson CM, Cook JR, Giugliano RP, et al., for the TIMI 10B and 14 Investigators. Early coronary intervention following pharmacologic therapy for acute myocardial infarction (the combined TIMI 10B-TIMI 14 experience). Am J Cardiol 2001;88:831-6. 26. Cannon CP, Weintraub WS, Demopoulos LA, Vicari R, Frey MJ, Lakkis N, et al., for the TACTICS-TIMI 18 Investigators. Comparison of early invasive and conservative strategies in patients with unstable coronary syndromes treated with the glycoprotein IIb/IIIa inhibitor tirofiban. N Engl J Med 2001;344:1879-87. 27. Heestermans T, vañt Hof AW, ten Berg JM, van Werkum JW, Boersma E, Mosterd A, et al. The golden hour of prehospital reperfusion with triple antiplatelet therapy: A sub-analysis from the ongoing tirofiban in myocardial evaluation 2 (On-TIME 2) trial early initiation of triple antiplatelet therapy. Am Heart J 2011;160:1079-84.